Josephine turns cold water into a delicacy. Her drinking glass, inverted, sits atop the carafe like a cork. 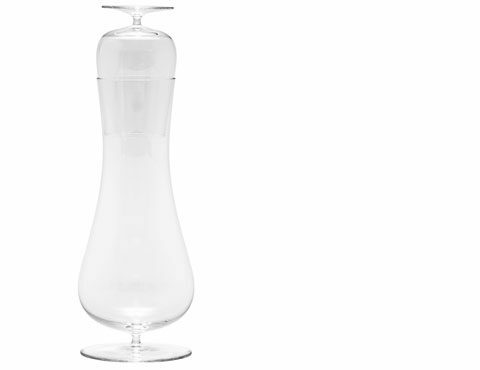 It is the simple principle of this carafe, which cuts a fine figure beside the bed or on the desk. The base is a feature of both the carafe and the glass. It provides stability, emphasises their elegance, and continues the formal tradition of Lobmeyr. Josephine is practical. The curve of her neck and its handpolished rim allow for a pour without spills, while any drops of water that might remain in the glass when it is returned to its place run back into the carafe. 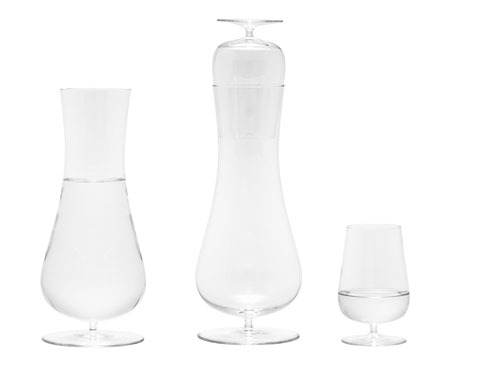 A series of sketches and prototypes led to the precise calculation of the form and fit of the glass and carafe. This particular project was born of a broader collaboration between Lobmeyr and POLKA, the intention of which is to develop exclusive objects to refine everyday rituals. Its elegant form, produced in the finest muslin glass, fits perfectly in the range of classics for which the Austrian glass manufacturer is internationally renowned.